Authenticity of the Qur'an. How It Came To Be Written. Thanks to its undisputed authenticity, the text of the Qur'an holds a unique place among the books of Revelation, shared neither by the Old nor the New Testament. In the first two sections of this work, a review was made of the alterations undergone by the Old Testament and the Gospels before they were handed down to us in the form we know today. The same is not true for the Qur'an for the simple reason that it was written down at the time of the Prophet; we shall see how it came to be written, i.e. the process involved. In this context, the differences separating the Qur'an from the Bible are in no way due to questions essentially concerned with date. Such questions are constantly put forward by certain people without regard to the circumstances prevailing at the time when the Judeo-Christian and the Qur'anic Revelations were written; they have an equal disregard for the circumstances surrounding the transmission of the Qur'an to the Prophet. It is suggested that a Seventh century text had more likelihood of coming down to us unaltered than other texts that are as many as fifteen centuries older. This comment, although correct, does not constitute a sufficient reason ; it is made more to excuse the alterations made in the Judeo-Christian texts in the course of centuries than to underline the notion that the text of the Qur'an, which was more recent, had less to fear from being modified by man. In the case of the Old Testament, the sheer number of authors who tell the same story, plus all the revisions carried out on the text of certain books from the pre-Christian era, constitute as many reasons for inaccuracy and contradiction. As for the Gospels, nobody can claim that they invariably contain faithful accounts of Jesus's words or a description of his actions strictly in keeping with reality. We have seen how successive versions of the texts showed a lack of definite authenticity and moreover that their authors were not eyewitnesses. Also to be underlined is the distinction to be made between the Qur'an, a book of written Revelation, and the hadiths, collections of statements concerning the actions and sayings of Muhammad. Some of the Prophet's companions started to write them down from the moment of his death. As an element of human error could have slipped in, the collection had to be resumed later and subjected to rigorous criticism so that the greatest credit is in practise given to documents that came along after Muhammad. Their authenticity varies, like that of the Gospels. Not a single Gospel was written down at the time of Jesus (they were all written long after his earthly mission had come to an end), and not a single collection of hadiths was compiled during the time of the Prophet. The situation is very different for the Qur'an. As the Revelation progressed, the Prophet and the believers following him recited the text by heart and it was also written down by the scribes in his following. It therefore starts off with two elements of authenticity that the Gospels do not possess. This continued up to the Prophet's death. At a time when not everybody could write, but everyone was able to recite, recitation afforded a considerable advantage because of the double-checking possible when the definitive text was compiled. The following was the first Revelation (sura 96, verses 1 to 5) [ Muhammad was totally overwhelmed by these words. We shall return to an interpretation of them, especially with regard to the fact that Muhammad could neither read nor write.]. Who taught man what he did not know." Texts formally prove that long before the Prophet left Makka for Madina (i.e. long before Hegira), the Qur'anic text so far revealed had been written down. We shall see how the Qur'an is authentic in this. We know that Muhammad and the Believers who surrounded him were accustomed to reciting the revealed text from memory. It is therefore inconceivable for the Qur'an to refer to facts that did not square with reality because the latter could so easily be checked with people in the Prophet's following, by asking the authors of the transcription. Yusuf Ali, in the commentary to his translation, 1934, wrote that when the Revelation of this sura was made, forty-two or forty-five others had been written and were kept by Muslims in Makka (out of a total of 114). In a book well kept Which none but the purified teach. This is a Revelation from the Lord of the Worlds." "They said: Tales of the ancients which he has caused to be written and they are dictated to him morning and evening." Here we have a reference to the accusations made by the Prophet's enemies who treated him as an imposter. They spread the rumour that stories of antiquity were being dictated to him and he was writing them down or having them transcribed (the meaning of the word is debatable, but one must remember that Muhammad was illiterate). However this may be, the verse refers to this act of making a written record which is pointed out by Muhammad's enemies themselves. Kept pure where are decrees right and straight." The Qur'an itself therefore provides indications as to the fact that it was set down in writing at the time of the Prophet. It is a known fact that there were several scribes in his following, the most famous of whom, Zaid Ibn Thâbit, has left his name to posterity. "The sources all agree in stating that whenever a fragment of the Qur'an was revealed, the Prophet called one of his literate companions and dictated it to him, indicating at the same time the exact position of the new fragment in the fabric of what had already been received . . . Descriptions note that Muhammad asked the scribe to reread to him what had been dictated so that he could correct any deficiencies . . . Another famous story tells how every year in the month of Ramadan, the Prophet would recite the whole of the Qur'an (so far revealed) to Gabriel . . ., that in the Ramadan preceding Muhammad's death, Gabriel had made him recite it twice . . . It is known how since the Prophet's time, Muslims acquired the habit of keeping vigil during Ramadan, and of reciting the whole of the Qur'an in addition to the usual prayers expected of them. Several sources add that Muhammad's scribe Zaid was present at this final bringing-together of the texts. Elsewhere, numerous other personalities are mentioned as well." Extremely diverse materials were used for this first record: parchment, leather, wooden tablets, camels' scapula, soft stone for inscriptions, etc. At the same time however, Muhammad recommended that the faithful learn the Qur'an by heart. They did this for a part if not all of the text recited during prayers. Thus there were Hafizun who knew the whole of the Qur'an by heart and spread it abroad. The method of doubly preserving the text both in writing and by memorization proved to be extremely precious. Not long after the Prophet's death (632), his successor Abu Bakr, the first Caliph of Islam, asked Muhammad's former head scribe, Zaid Ibn Thâbit, to make a copy. this he did. On Omar's initiative (the future second Caliph), Zaid consulted all the information he could assemble at Madina: the witness of the Hafizun, copies of the Book written on various materials belonging to private individuals, all with the object of avoiding possible errors in transcription. Thus an extremely faithful copy of the Book was obtained. The sources tell us that Caliph Omar, Abu Bakr's successor in 634, subsequently made a single volume (mushaf) that he preserved and gave on his death to his daughter Hafsa, the Prophet's widow. The third Caliph of Islam, Uthman, who held the caliphate from 644 to 655, entrusted a commission of experts with the preparation of the great recension that bears his name. It checked the authenticity of the document produced under Abu Bakr which had remained in Hafsa's possession until that time. The commission consulted Muslims who knew the text by heart. The critical analysis of the authenticity of the text was carried out very rigorously. The agreement of the witnesses was deemed necessary before the slightest verse containing debatable material was retained. It is indeed known how some verses of the Qur'an correct others in the case of prescriptions: this may be readily explained when one remembers that the Prophet's period of apostolic activity stretched over twenty years (in round figures). The result is a text containing an order of suras that reflects the order followed by the Prophet in his complete recital of the Qur'an during Ramadan, as mentioned above. One might perhaps ponder the motives that led the first three Caliphs, especially Uthman, to commission collections and recensions of the text. The reasons are in fact very simple: Islam's expansion in the very first decades following Muhammad's death was very rapid indeed and it happened among peoples whose native language was not Arabic. It was absolutely necessary to ensure the spread of a text that retained its original purity. Uthman's recension had this as its objective. The 114 suras were arranged in decreasing order of length; there were nevertheless exceptions. The chronological sequence of the Revelation was not followed. In the majority of cases however, this sequence is known. A large number of descriptions are mentioned at several points in the text, sometimes giving rise to repetitions. Very frequently a passage will add details to a description that appears elsewhere in an incomplete form. 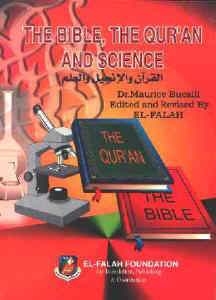 Everything connected with modern science is, like many subjects dealt with in the Qur'an, scattered throughout the book without any semblance of classification. * It is imporatnt to say that Qur'an was collected during the Prophet's lifetime. The Prophet, and before his death, had showed the collection of Qur'an scrolls to Gabriel many times. So, what is said in regard to collecting of Qur'an during the ruling period of the Caliphs after the Prophet means copying the same original copy written in the Prophet's life which later were sent to different countries, and it does not mean the recording or writing of Qur'an through oral sources as it may be thought. Yet, many of the Companions have written the Qur'an exactly during the lifetime of the Prophet. One of those was Imam Ali's copy. He, because of his close relation with the Prophet, his long companionship, didn't only collect the dispersed scrolls of the Qur'an, but he rather could accompany it with a remarkable Tafseer, mentioning the occasion of each verse's descension, and was regarded the first Tafseer of Qur'an since the beginning of the Islamic mission. Ibn Abi Al-Hadeed says," All the scholars agree that Imam Ali is the first one who collected the Qur'an," (see Sharhul Nahj, 271). Another one, Kittani, says that Imam Ali could arrange the Qur'an according to each surah's order of descension, (see Strategic Administration, 461). Ibn Sireen Tabe'ee relates from 'Ikrimeh, who said that 'lmam Ali could collect the Qur'an in a manner that if all mankind and jinn gathered to do that, they could not do it at all,' (see al-Itqan 1157-58). Ibn Jizzi Kalbi also narrates, "If only we could have the Qur'an which was collected by Ali then we could gain a lot of knowledge," (see al-Tasheel, 114). That was only a brief note about the benefits of Imam Ali's Mus'haf, as Ibn Sireen had declared, "I searched so long for Imam Ali's Mus'haf and I correspounded with Medina, but all my efforts gone in vain.' (see al-Itqan, 1/58, al-Tabaqat,2/338). Thus; it becomes certain that Qur'an has been collected by Imam Ali without simple difference between it and other known copies, except in the notes mentioned by Him which renders it as the most excellent copy has ever been known. Unfortunately, the inconvenient political conditions emerged after the demise of the Prophet, (i.e after the wicked issue of Saqeefah) was a main obstacle to get benefits from that remarkable copy of the Qur'an.